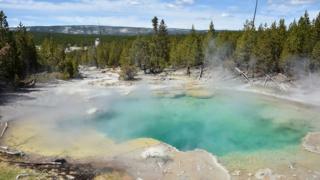 The remains of a man who died in a hot spring accident in Yellowstone National Park were dissolved before they could be recovered, it has emerged. Colin Scott, 23, died in June in an illegal attempt to soak, or "hot pot", in the US park's thermal pools. The accident was recorded by the victim's sister on her mobile phone, the incident report says. The grisly details came to light following a freedom-of-information request by local television news. Established in 1872, Yellowstone National Park is located mostly in the state of Wyoming but extends into parts of Montana and Idaho too. According to the incident report, Mr Scott and his sister, Sable Scott, left the defined boardwalk area in Norris Basin on 7 June. "The whole area is geothermally active," Yellowstone's deputy chief ranger Lorant Veress told KULR 8, which broke the story. "There's a closure in place to protect people from doing that for their own safety. It's a very unforgiving environment." He said the pair had been specifically looking for an area to soak in the thermal springs, despite the potential danger and warning signs. Ms Scott was recording a video of her brother on the phone as he reached down to test the water, before he slipped and fell in. Authorities did not share the video, or a description of its contents, out of sensitivity to the family, the report says. Rescue teams later found his body in the pool but abandoned attempts to retrieve it due to the decreasing light available, the danger to themselves and an approaching lightning storm. The following day, workers were unable to find any significant remains in the boiling water. "In a very short order, there was a significant amount of dissolving," Mr Veress said. The area of the park where the accident took place is on the edge of the famous Yellowstone caldera, a "supervolcano" or "hotspot". The caldera's activity fuels the thermal pools in the area and it also has the potential for a "cataclysmic" eruption which would change global climate for decades. However, experts at the US Geological Survey, which carefully monitors the area, say "the chances of this sort of eruption at Yellowstone are exceedingly small in the next few thousands of years."